The Furutech FI-68 is a sophisticated inline power filtering device that is used to terminate onto your favorite AC power cable, and is used in place of a conventional IEC connector. The FI-68 eliminates many common issues that are caused by contaminated electrical power lines. 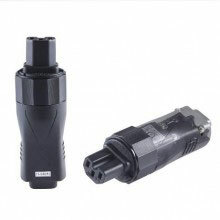 The FI-68 offers protection against distortion caused by ground noise, voltage spikes and sags, high frequency power supply noise from other components in your own system, as well as high-frequency digital noise emanating from processors and digital interconnects. Your residential AC supply is shared with other apartments, homes, and businesses on the same utility transformer, which may help explain why many audiophiles find their systems perform even better late at night and over weekends. 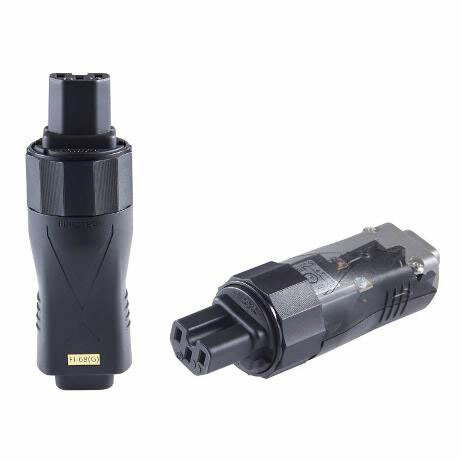 While the Furutech FI-68 performs exceptionally well at eliminating common AC problems, it does so without restricting current draw in any way, as confirmed by extensive testing by Furutech's engineers. The Furutech FI-68 IEC connector with Filter helps lower noise on every component on which it’s used, resulting exceptionally natural yet extremely fine resolution down to, and ultimately through the utterly silent noise floor. It improves soundstaging and imaging while allowing the nuanced high frequencies that are actually present in the recording to shine. It also allows an engaging midrange, tight and controlled bass, with power and dynamics to spare. Housing material formed of nylon and fiberglass also incorporates a special concentrated stainless steel fiber in resin. This combination of materials promotes static dissipation and improves EMI shielding – attaining above 40dB of EMI shielding effectiveness.